Chaddleworth is a welcoming house with peaceful and comfortable bedrooms offering tea and coffee making facilities, hairdryers and television in each room. Free wifi is also available. Located on the top floor, this spacious room can be either a twin or a double with its own ensuite bathroom including a separate shower and bath. There is a sofa and seating for relaxing in at the end of the day. The room enjoys Southerly views towards the village of Streatley looking across the tops of the trees and garden up on to the Holies and also Westerly views out towards Thurle Down in the direction of the Ridgeway. It is possible to put another bed in this room at a small extra charge. On the first floor, this room can be set up as a twin or double. It has its own use but separate bathroom providing a shower and bath . There is a door out on to a flat roof (where you can sit in the summer) with views on three sides to the trees and garden and also a window giving a westerly view towards Lough Down. Within the price per person per night, a full cooked breakfast is included, with cereals, toast, and a range of homemade jams & marmalade. Cooked breakfast includes bacon and sausage bought locally at a renowned Butchers called Vicars Game Ltd. They make their own sausages using the finest quality meat and their bacon is dry cured on site. 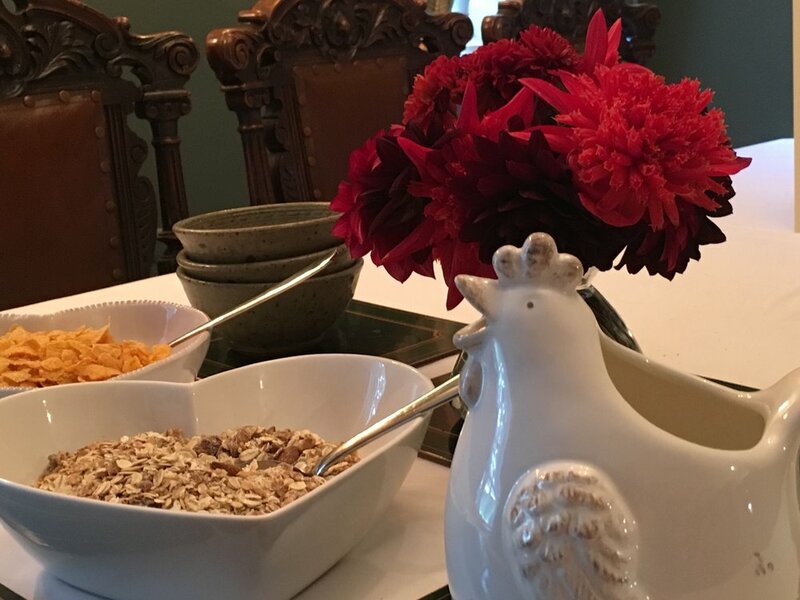 Breakfast is served in our family Dining Room. Dietary requirements are easily catered for; please let us know at time of booking. We are delighted to have been awarded the highest food hygiene rating of 5 from Environmental Health & Licensing.